The National Road holds a special place in Ohio's history as well as the nation. The National Road was the first federally planned and funded interstate highway. Crossing 6 states (Maryland, Pennsylvania, West Virginia, Ohio, Indiana and Illinois), the road linked older eastern communities with the emerging frontier settlements of the Northwest Territory. In a generation of use, the populations of Ohio, Indiana, and Illinois grew from 783,635 to over 3.72 million people. George Washington was an early supporter of a road to the west. Even before the Revolutionary War, his extensive western travels, experiences as a military commander, and land speculating convinced him that a "smooth way" was needed to "open a wide door" to the west. After the Revolutionary War, with increasing numbers of settlers moving west, Washington soon realized there was a danger of these pioneers forming political ties with Spain and England who still had influence in the Northwest Territory. In 1784 Washington traveled to the west, in part to contemplate the best routes for portages and roads Along the way he would ask settlers their views of the best routes for a possible road. While staying at a land agent's cabin near present-day Morgantown, West Virginia he met a young surveyor who would later play an important role in making the national road a reality, Albert Gallatin. Gallatin advised Washington on possible routes for the road and 18 years later, while serving as Jefferson's Treasury Secretary, he helped formulate the plan to fund the National Road project. In 1806, Thomas Jefferson made that roadway a reality when he authorized an Act to regulate the laying out of a road from Cumberland, Maryland to Ohio. Construction on the National Road began in 1811 at Cumberland, extending an existing route from Baltimore. The National Road reached the Ohio River at Wheeling in 1818, poised to make its entry into Ohio. However, politics got in the way and stopped construction for several years until the political debate was resolved on whether the Federal government had the authority to build a road. President James Monroe finally got the construction started again in 1824 when he signed a bill that authorized further spending on the National Road and ground was broken on July 4, 1825 for the first time Ohio for construction of the National Road. Ironically, this was also the same day that the Ohio & Erie and the Ohio & Miami Canals saw the first shovel full of dirt being moved. The Federal government paid for the National Road in Ohio by selling land that it had acquired from the Native Americans living here. Although Ohio was experiencing incredible growth during this time, it was not without controversy. Native Americans living in Ohio were first defeated in battle and extended campaigns with the American military, then forced to sign treaties consigning them to specific areas of the state, and then eventually forcing them out of the area entirely. It's hard to imagine construction of a project this size without the use of power equipment we're so familiar with today. In the early 1800s, everything was done using manual labor, and where possible draft animals were used to haul materials. But it was the men and their own physical labor that constituted the bulk of the work. First step were to bring in laborers with mattocks, axes, hoes, rakes, and shovels who cleared the land. Trees were cut, stumps removed, and brush cleared by a combination of man and animal power. In some places entire hills were leveled, hollows filled; rock was hauled in or carted away. All just to get the area ready to build the road surface. Before the road was completed, a new road building process was introduced called macadamization. Macadamization was brainchild of Scottish engineer John Macadam. Building a macadam road required building the road with layers of stone. The lowest layer was 12-18" deep and consisted of base stones approximately 7" (they had to pass through a ring of that size) in diameter. The road was then graded up with smaller stones (which had to pass through a 3" ring) and gravel. The smaller surface stone was mixed with soil and rounded off to allow for drainage. Drainage ditches were dug along side. Diorama detail from the National Road Museum on US40 east of Zanesville shows a Conestoga wagon crossing one of the famous "S" bridges, several of which can still be seen today. From the beginning the road was heralded as a great and useful achievement. This period can be called the Heyday Period of the National Road and it spanned a period of about 25 years. From 1825 to 1850, the National Road was the primary route immigrants and east coast settlers used in their western migration. Small towns sprung up along the pike. 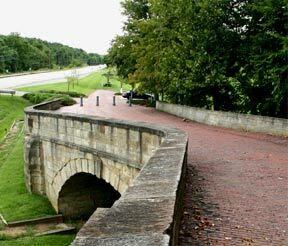 At the time, the National Road was considered an engineering marvel that features stone arched bridges and culverts that cross Ohio's countryside. Commerce thrived as 1000s of wagons, coaches, carriages, and horseback riders moved across the state. By 1837 14 of the state's 32 established stage routes connected to the National Road. Already established towns like Zanesville and Cambridge began to take on added importance along the new road, and completely new town were being laid out along the pike. When the Federal government stopped funding for maintenance on the National Road, keeping the road in shape fell to the state to maintain the road. The state decided that those who used the road, should pay for the road's maintenance. In 1832 tolls began being charged. Toll-houses were built about every 20 miles. Exact tolls were determined by the type of vehicle and the expected wear and tear these vehicles might cause to the road. For example, 2-horse carriages and cattle were charged the highest toll, but large wagons with wheels larger than 6" wide were free to travel. Toll keepers were free to travel to and from church and funerals. Between 1831 and 1877 about $1,250,000 were collected. Even with this built -in funding, the National Road could not be maintained in good condition. Tolls were collected in some areas until 1910. Two-hundred and twenty miles of the National Road ran through Ohio and a stone marker on the north side of every mile told travelers how many miles they were from Cumberland, Maryland, the beginning point of the highway. 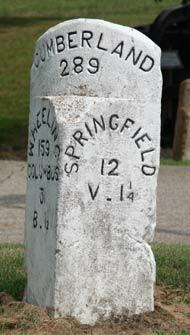 To date, over 83 of these Mile Markers remain along the original routes of US 40. The Fox Creek "S" Bridge is one of a series of such bridges which lined the path of the National Road. 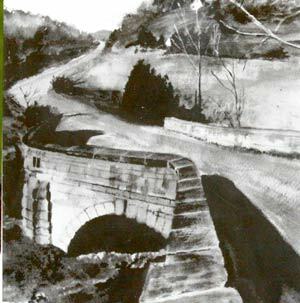 All but just a handful of these special bridges were destroyed during the construction of U.S. Route 40. The National Road, completed here in 1828. Four of these graceful engineering marvels remain intact in Belmont, Guernsey and Muskingum Counties. The unique S-shape of the bridge was designed so the bridge would cross a stream or river at a 90-degree angle, the shortest distance for the bridge’s span. Since most streams ran north/south, and the road went east/west, the S-shape enabled the bridge to make the turn to cross the body of water, and then turn back to maintain the direction of the road. Built of sandstone quarried in the nearby hills, these bridges display authentic craftsmanship of the early National Road period. Bridges that were bypassed with the construction of U.S. 40 managed to survive. The entire National Road from Cumberland, Maryland, to Vandalia, Illinois, was bricked during World War I to accommodate military traffic. The Fox Creek "S" Bridge was the last section to be bricked in 1919 (celebration of this event at the Fox Creek Bridge is pictured above). Railroads had a great effect upon the National Road. As rail transportation became a more economical and efficient, once bustling Ohio pike towns of the 1830s and 1840s were transformed into quiet villages. Villages and cities with railroad crossings continued growing but adapted to the new requirements the railroads demanded. Communities that served as county seats or, in the case of Columbus the state capital, especially thrived during the late 19th century, attracting the variety of business, civic and cultural establishments needed to serve the needs of a growing population. During this declining period of use, the roadbed was poorly maintained and often dangerous in many sections. Late in the 19th century, the invention of the bicycle prompted renewed use of the old road and a demand for a better road surface. Lobbying for road improvements came to be known as the “Good Roads Movement.” This cause gained further momentum with the invention of the automobile. By 1900 there were 8,000 automobiles in the United States, a number that would grow exponentially just 10 years later. In 1916, Congress passed the Good Roads Act, providing $75 million for states that organized “responsible highway departments.” The need for road improvements sparked interest in new construction materials. Experimental concrete was used to pave a section of the National Road between Zanesville and Hebron in Licking County in 1914. Today a marker stands at a point called the Eagles Nest just west of Brownsville dedicated to that experiment. After the conclusion of the concrete experiment, it became apparent that the new concrete could be used as a paving material for substantially lower cost than brick. Early concrete paving on the National Road. In 1918, the National Road was chosen by the Federal government as the best means of transporting military supplies overland to assist in the WWI effort. 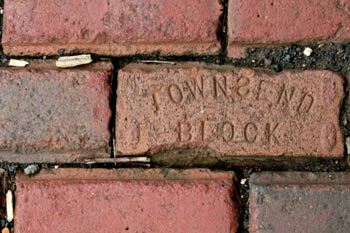 Over 75 miles of the road in eastern Ohio were paved with brick, creating the longest continuous stretch of brick pavement in America at the time. Asphalt was the preferred pavement material by the early 1930s. The National Road became U.S. Route 40 in 1926. This federal route did not strictly follow the old road, but was frequently realigned and redirected to bypass small towns or to straighten and level the roadbed for faster and safer travel. Route 40 turned its attention to the automobile, and with all of its truck stops, diners, and motor courts, soon became known as the “Main Street of America.” Traffic on U.S. 40 peaked in 1960 and soon diminished following the construction of Interstate 70 over the next decade. 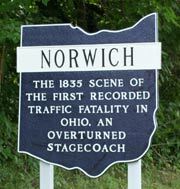 The Ohio Department of Transportation designated the Historic National Road as a state scenic byway in 2002 and the road received All-American Road designation by the Federal Highway Administration. 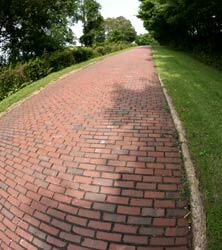 The Historic National Road in Ohio is just part of 700 miles of Scenic Byway stretching from Baltimore thru Illinois. In the early days of the National Road, the most often seen vehicle on the road was the Conestoga wagon. These were often seen as 4 or 5 wagons traveling together across the road. Conestoga wagons were first made in the Conestoga Valley of Lancaster County, Pennsylvania starting around 1750. They were regularly used by settlers for the next 100 years as they moved from the east into the new Ohio territory.